The Noche Buena, night of goodness, is to the Filipino not really just Christmas Eve, to which the term refers, but also and specifically the meal shared by the family after the midnight mass. It is also called media noche – another transposition of the name for a time into the name for a meal – because, as my mother Dr. Alicia Lucero Gamboa, no one was allowed to eat till after midnight mass; one fasted, especially from meat, for the feast early on Christmas morning. It is not usually shared with guests, only with family, and usually only with the nuclear family, the very closest and dearest. It is for many Filipino families, therefore, the most meaningful meal of the year. It certainly is high on the consciousness of many. “What is your Christmas meal?” the PAL man at the Cebu airport counter asked me as I breathlessly handed him my ticket (it was almost counter-closing time). “I want to tell my wife about it.” It was still a month to Christmas, and already he was thinking of the feast and the media noche, and the preparations for it. “Baked, sugared ham,” I would have answered him, if I hadn’t been so busy checking in luggage and receiving ticket and boarding card. “The jamon China or jamon en funda (it came in cloth sacks) which had been cooked in beer, baked with cloves, and glazed with sugar. And my mother’s galantine, which she steamed in cheese-clot wrappings, and was good hot or cold. And…” but I am no longer sure which Noche Buena I am referring to – those with Papa and Mama as a child, or those with Lola Florentina at Lucero family reunions in Manila, or those I have gathered from other people’s customs and made my own. Lechon [roast pig] was what my father, the late Aguinaldo S. Gamboa, remembered as Noche Buena fare in Silay, Negros Occidental, as he grew up: lechon the Negros way, fragrant with tanglad [lemongrass] stuffing. To this my aunt Meling Gamboa now adds pancit molo, hamon, and lukon, the prawns presently stellar in the Negros economy, which because of their size and luxury have always been special. “Morcon!” declared Mario Severino Torres, also of Silay, who runs the well-known SIR carinderia where many get their party fare. They would often have relyenong bangus [stuffed milkfish], sometimes even roast turkey, but always, Mama and Lola before her, would prepare morcon [meat roll], plus the obligatory castanas [roast chestnuts], hamon, and queso de bola [edam cheese ball]. “Suman,” asserts Fely G. Onque, now a teacher at Toledo (Cebu) National Vocational High School, but born in Tagbilaran, Bohol. Suman to eat at midnight with thick hot tsukwate (chocolate), and suman as well to give away. The family with some money would splurge on a whole leg of homemade ham, but rich or poor, everyone had suman. “Yes, suman definitely,” adds Elisa San Juan, mayor of Toledo City, Cebu, and wife to Dr. Teodulo San Juan, medical director of the Atlas Mining Corporation. “Many kinds of suman, sometimes.” But because she is originally from Guagua, Pampanga, she also has cocido, a fat chicken relleno, and often the panara which Pampangos eat with putong lusong in the churchyard pf San Fernando after midnight mass – as they watch the giant whirling kaleidoscopic lanterns for which the town in uniquely famous. 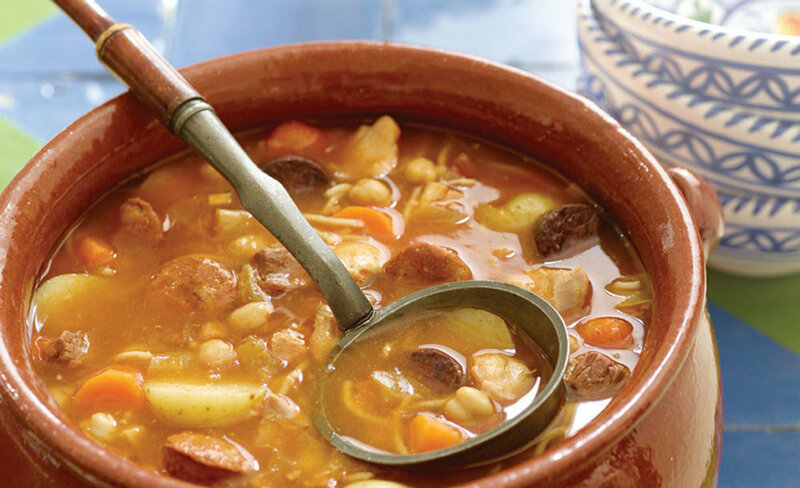 Cocido was her family Christmas centerpiece, the late Enriqueta David Perez told me many years ago, when I interviewed her for the first piece on Christmas food which I ever wrote. It was the old-fashioned recipe with meats (beef kenchi, marrow bones, chicken, pork), sausages (chorizo de Bilbao, marcilla or blood sausage), ham vegetables (cabbage, pechay, carrots, potatoes, onions), tomato sauce and a thick broth – served of course with the contrast and complement of an eggplant sauce. Roast chicken is what Nenett Manzo remembers. Formerly of Silay, Negros Occidental but now of Cebu City, when she teaches at the Florencio Urot Memorial High School, she says it was chicken not stuffed, just roasted. Inasal, says Jocelyn Pineda of La Castellana, Negros Occidental , or “whatever Nanay cooked,” usually of pilit (malagkit or sticky rice) and butong (buko), and a spit-roasted chicken. Yes, chicken, confirms Tessie Ramos of Albay – cooked in gata [coconut milk], special because the so seldom had it, and after the holidays returned to having fish and vegetables. Jose Dorado of Panit-an, Capiz, remembers roast chicken as well, as Noche Buena basic. It was readily available, yet it was special. When he and his late wife Carol had a family, however, she always prepared a special chicken macaroni salad, which she would also put in jars and give away to friends and relatives at Christmas. Mr. Dorado would prepare the Ilongo suman sa ibus, which is wrapped in young coconut fronds, or in fragrant payaw leaf (called agik-ik in both Waray and Manobo). Now that the Dorado family has settled, and the children have grown up in Tacloban City, it still their mother’s chicken macaroni salad that makes Crhistmas – the constant, to which they add roasted chicken or ham, or other current fancies like chocolate or fruit cake. Suman too, is what their cook Mana Inday Bagason prepares for her own family. Seldom can they afford the chocolate as well, but the suman is special, prepared with two tastes – salty and sweet, and wrapped to indicate the distinction. “Arroz caldo,” says Conrad Calalang, restaurateur now, but native son of Bulacan first. “In Malolos, you always start with arroz caldo. It is yellow with the kasubha and with the fat of the chicken, and it has lots of dahong sili [pepper leaves] in it, but the flavor comes from the ginger-patis [fish sauce] combination, cooked sangkutsa [sautéed].” With it must go, he says, the Malolos puto (rice cake) with sangke (star anise). 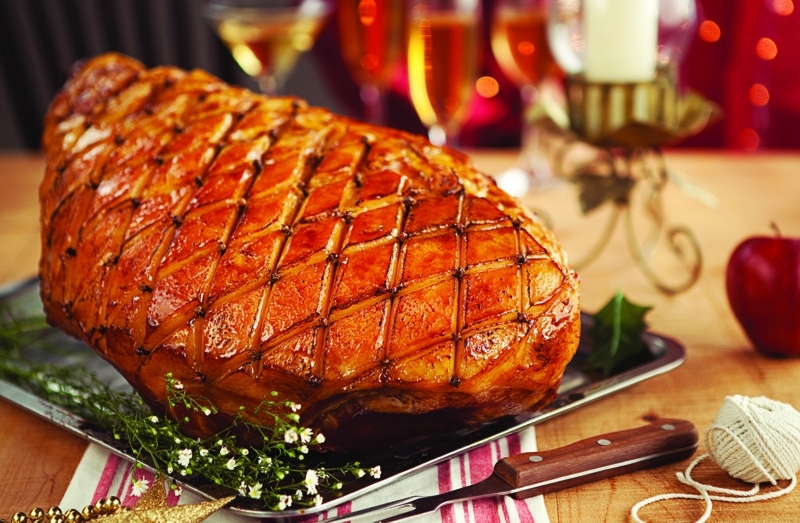 And in his family, his mother usually served as well a Smithfield Ham (yes, the salty ham from the U.S.), although there might also be Hoc Shiu (jamon China). Different, is what Nancy Reyes calls their family media noche, because it is not limited to the family circle. Six Reyes families usually spend it with the nuns of Vigil House in New Manila, who have been beneficiaries of their giving during the year, and who reciprocate at the Christmas midnight dinner. The food is always pospas, puto, ham, queso de bola, and chocolate, and the nuns then raffled off gifts for the some-40 Reyeses present. Rubing, 55, a driver in Negros, is a bachelor, but says that of course he has Noche Buena, even if it is by himself: pansit which he buys, and ilimnon, drinks. Fe Redito Rebueno, of Oas, Albay, says that in their family it was not the custom to eat after the mass, but to wait till Christmas morning for a big feast of embutido, paella, lechon, fried chicken, leche flan, fruit salad, and ibus. She believes that only the elite 20- or 30% in Albay have a midnight meal. She herself feels that the helpers should be clearing up a meal after midnight, but preparing to go to mass themselves, and so she has made a family tradition of celebrating on Christmas Day. Noche Buena/media noche is certainly, however, a cherished custom with many. Children remember the savors, and the thrill of eating after midnight. Parents recall the labor and the joy of preparing, planning, budgeting and setting or carrying on family traditions. Christmas, however, is also a feast built on an older celebration – harvest, probably. It is therefore syncretic, acquiring meaning and symbols from pre-Christian observances. Thus a constant that runs through many of these feasts is rice – whole or ground, sticky or otherwise, often sweetened – in the forms of suman, ibus, bibingka, puto bumbong, puto maya, etc., or even arroz caldo and pospas. Rice figures in our pre-Christian rituals – offerings to the gods, marriage ceremonies, fertility rites. It is so basic to our food life that is appropriately symbol as well as staff of life. And so it now figures in this most Christian of feasts, and we give thanks, we celebrate, we offer each other rice on the important days of our year’s passage. The poor may have just the suman or ibus, or, when they can, a chicken to add to it. The rich may concentrate on foods from the Spanish Christmas, as well as from the American (roast turkey, fruit cakes), but they too, retain the rice. Noche Buena, night of goodness, is thus not only hallowed by the birth of Christ, by Christian tradition and family customs, but by life forces earlier than anyone remembers, by stirrings of the Filipino ethos. It is indeed, for rich and poor, a meal meaningful beyond memory. 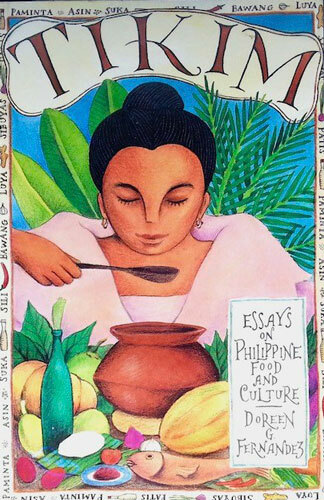 Reprinted with permission from Tikim: Essays on Philippine Food and Culture by Doreen G. Fernandez (Anvil Publishing Inc., 1994).